The 2300 Series Panel Door magnetic contacts are designed specifically for panel or sectional style overhead doors. 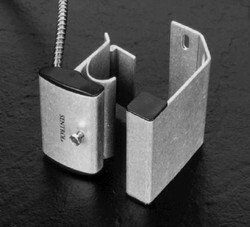 The unique design allows the contact to be mounted directly to the door channel, with the magnet mounted vertically on the door. 2315A / 2317A: Fits Rails 1.5" to 2.4"
2325A / 2327A: Fits Rails 2.75" to 3.25"
Response Time: 1 msec. max.